You can help ensure that children and families will have holiday meals this winter. It is now easier than ever to to help families in need. With the Virtual Food Drive you can purchase and donate essential food items without ever leaving your house. Simply visit the online store, select the items you’d like to donate, and pay for your cart as if you were making a purchase. While we still love in-person food donations, the Virtual Food Drive provides a unique opportunity for us to leverage our bulk purchasing power and network relationships to buy as much food as possible and make each penny donated stretch as far as possible. 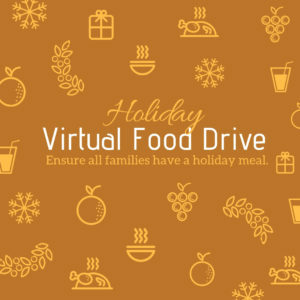 Additionally, if you are feeling especially inspired, you can set up your own Virtual Food Drive for your friends, teammates, school, or group to make an even bigger impact. More information on hosting your own drive can be found at https://sbfoodbank.fenly.org/ . This entry was posted on October 16, 2018 by Hailey Phelan.